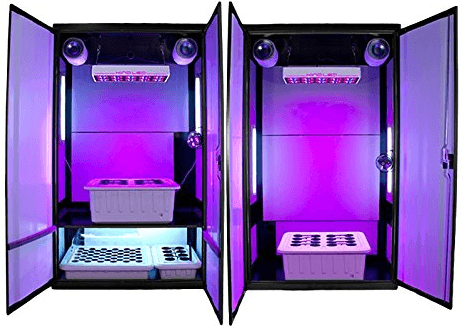 T5 grow lights for marijuana! 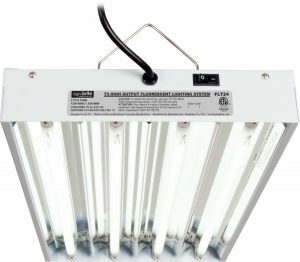 Best T5 grow light systems for 2017! Home Grow Lights Best T5 grow lights for marijuana 2018! 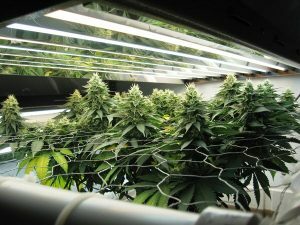 Looking for the best T5 grow lights for growing weed indoors? T5 grow lights are affordable, power efficient and typically do not require a cooling system, because they do not produce much heat. For these, and many other reasons, T5 marijuana grow lights are a great choice for beginner weed growers. 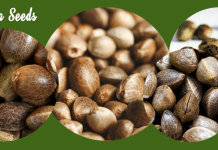 You can grow marijuana indoors, without the expense of metal halide or HID systems that use loads of energy and have to be replaced every year. T5 fluorescent bulbs are very energy efficient, and can end up saving you a lot of money on your electricity bill in the long run. It is really easy to get started growing marijuana with T5 lights, but you should always do your research before jumping in. 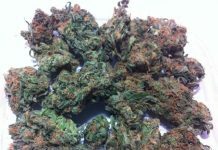 This T5 grow lights guide will help you choose the best T5 grow lights at the right price to grow your weed. 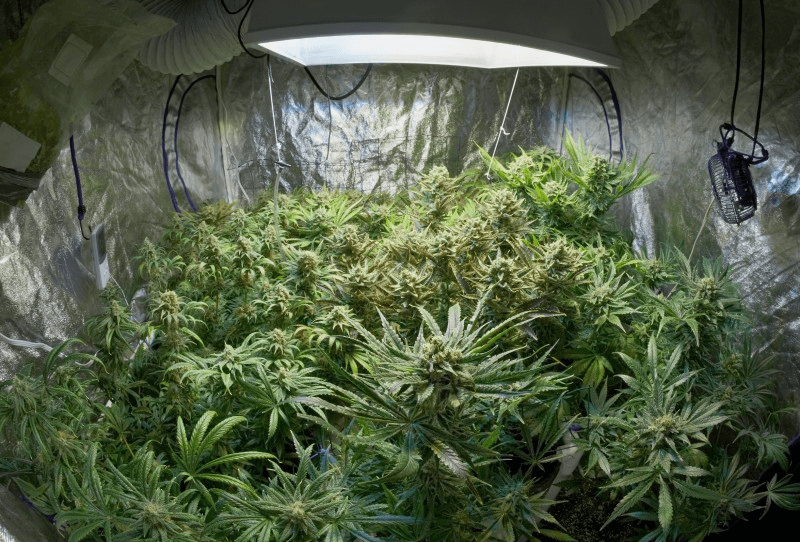 If you’re still undecided about the best type of grow lights to use for your indoor marijuana grow, please read our guide on the different grow light types for growing marijuana indoors. What are T5 grow lights? T5 grow lights are tubular fluorescent grow lights that are 5/8 inch in diameter. They are available in different tube lengths, for example 2 ft or 4 ft. The T5 tubes are slotted into a light fixture, which varies in size, weight and number of bulbs accommodated. The ballast is typically part of the light fixture. 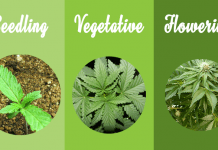 Why use T5 grow lights for weed? 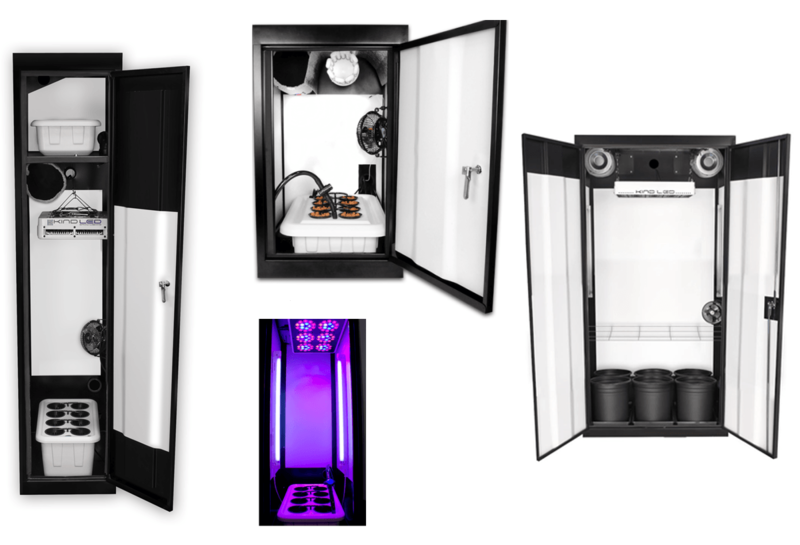 There are a number of good reasons to use T5 grow lights to grow marijuana indoors. Inexpensive: T5 grow lights are popular for growing weed because they are relatively inexpensive when compared to other grow light types. T5 grow lights are also cheaper to set, because the bulbs, ballasts and reflectors typically come in one package. Less electricity: T5 grow lights use less electricity when compared to other types. Low heat: T5 grow lights generate less heat than HID bulbs for example, and do not require a cooling system. 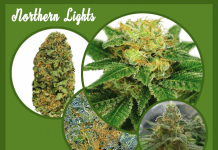 Light spectrum: T5 lights produce an impressive light spectrum for growing marijuana indoors. Small areas: You can position T5 lights inches from the cannabis plants, making them suitable for small grow areas. Fairly durable: T5 lights last for 20,000+ hours and maintain good bulb performance throughout. Young plants: T5 grow lights are a very good choice for clones, seedlings and young plants. 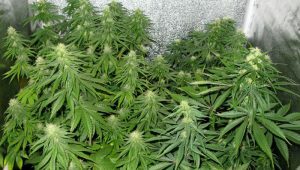 T5s are less likely than other marijuana grow light to burn the plants. T5 grow lights work best for growing marijuana throughout the vegetation stage. T5 lights can also be used for the flowering stage, but most growers switch to stronger lights during this stage. LED grow lights work well for this stage, but are more expensive. Plants thrive in different color temperatures during different phases of the growth cycle. You can buy T5 grow lights that emit different color temperatures for vegetative and flowering growth stages of the marijuana plant. The light emitted by T5 grow lights is only useful for about a foot or so. This is why you should maintain the lights very close to your marijuana plants. If your plants are further away than 1-2 feet, they will not receive the optimum amount of light. This is especially true in the flowering stage when plants need more light to produce buds. T5 grow lights are perfect for the vegetative stage because they will not burn the plants. 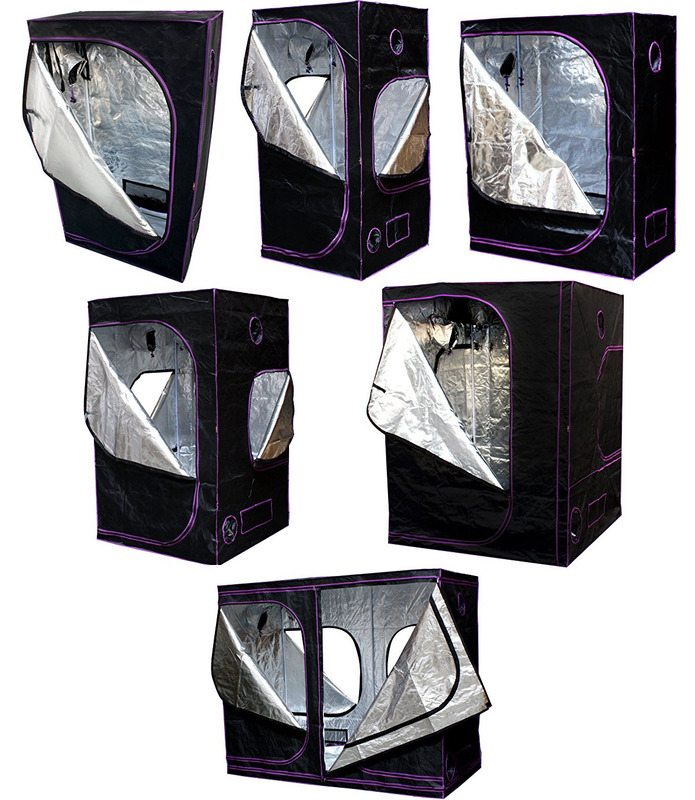 They also do not produce much heat in the grow room and are therefore particularly useful in warmer climates. During the vegetative stage, T5 grow lights in the blue spectrum with a color temperature of 5000 Kelvin or higher are ideal to maximize your cannabis plants’ growth. During the flowering stage, plants need T5 grow lights in the red spectrum, ideally between 2000 Kelvin and 3000 Kelvin. Although most growers switch to stronger grow lights for the flowering stages, many growers successfully flower their marijuana plants with T5 grow lights. T5 lights work best if the plants are kept short through growth control methods. 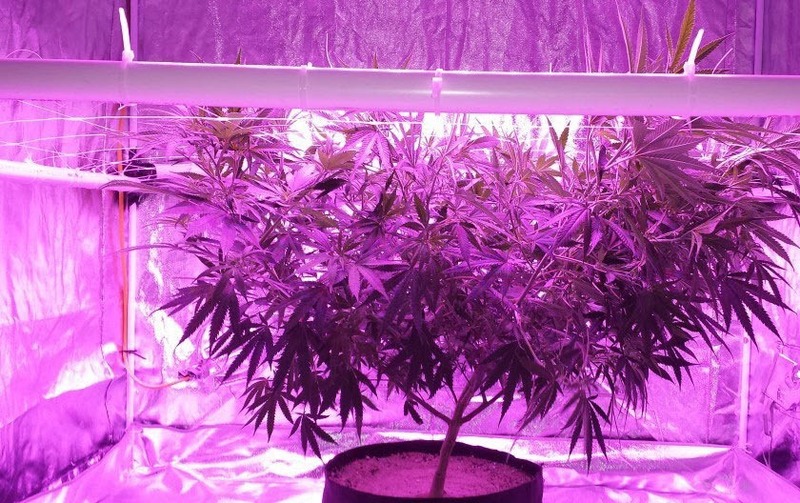 Weed plants need more light to produce buds than a fluorescent light typically produces. You can supplement your T5 tubes with additional light, for example a few CFL grow lights. Inefficiency: T5 grow lights produce approximately 20-30% less light per watt of electricity used when compared to other grow light types. 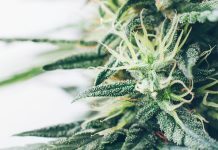 Smaller yields: T5 grow lights produce smaller yields per watt in the flowering stage when the buds are developing, compared to other kinds of grow lights. LEDs and HIDs can produces between 2 and 4 times the yield per watt. Penetration: Light from T5 grow lights does not penetrate far into the plants. The light is not powerful enough to nourish plants in the flowering stage. T5 grow lights are most suited to plants that are short and flattish. Require space: Although they can be placed only inches away from the plants, T5 grow lights are still bulky because they are 2 or 4 ft in length. Because they are comparatively inefficient, more lamps are required to produce the same output as a single 600 watt HPS light, for example. 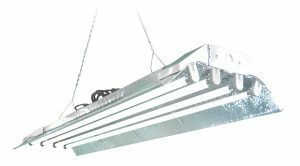 The Agrobrite Fluorescent Grow Light system includes the fitting, reflectors and bulbs. This T5 system comes in 2 ft and 4 ft lengths. 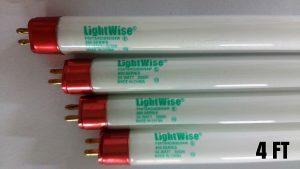 You can use 2, 4 or 8 fluorescent tubes with the 2 ft system, and 4, 6, 8, or 12 fluorescent tubes 4 ft system. The 2 ft, 4 bulb fixture is the best overall T5 grow light choice for indoor weed growers. 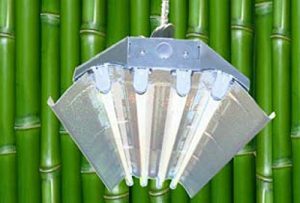 It is a low-profile fixture: perfect for growing in tight vertical or horizontal spaces . The Agrobrite T5 grow light system comes with 6400k bulbs and multiple switches. You can control how many lamps are on at any given time. 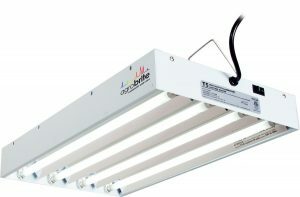 The Agrobrite fluorescent T5 grow light system delivers performance, flexibility and high lumen output. 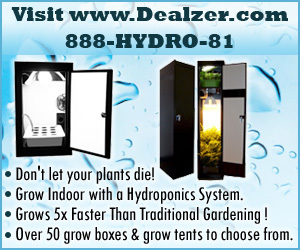 You can choose multiple hanging configurations to meet grow room’s needs and design. This T5 grow light system provides double the light energy of many fluorescent systems, by offering premium grade specular aluminum and energy-efficient, high-output T5 bulbs. The system comes with a 5 year warranty on the ballast and 1 year overall warranty. 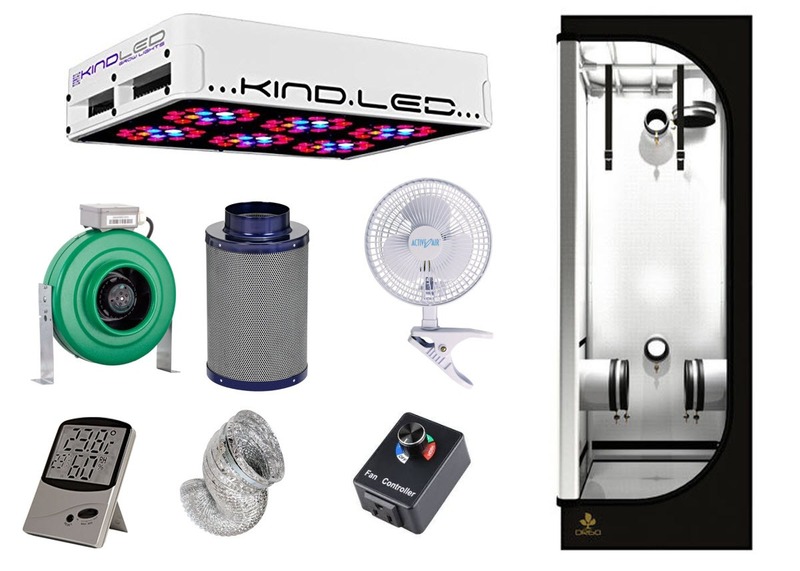 There are a lot of happy owners and growers online using this T5 grow light system. The Hydro Crunch T5 4 ft 8 lamp fluorescent grow light system gets our vote for the best system for large grow rooms. If you prefer a single lighting system to take care of all of your lighting needs, the Hydro Crunch is a superb choice. 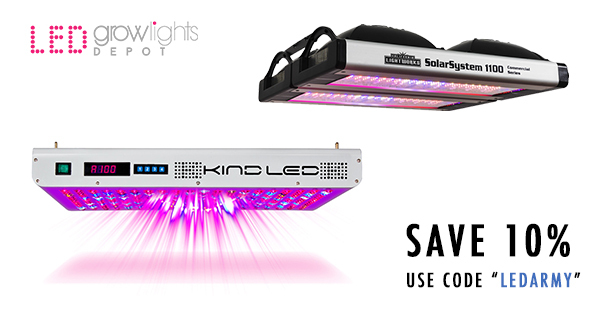 This grow light system maximizes light intensity and distribution with its 95% reflective aluminum frame. The system comes with a built in hanging wire for simple setup. You can hang this T5 system vertically or horizontally. It runs on 120V and includes 8 6500K HO bulbs and slotted housing for optimal cooling. The system is versatile and you can daisy chain it up to 3 ft. This provides the option to move the light as your plants grow. A single fixture is ideal for a medium sized area and will give you maximum energy efficiency. If you’re looking for bang for your buck, the DuroLux T5 Grow Light system is a good choice. It is a 4 ft system and includes 4 6500K bulbs. The DuroLux T5 grow light system has a gull-wing construction instead of an encased reflector. DuroLux says that their German-hammer tone reflector allows this lamp to emit up to 30% more light than other models. Many owners have commented that this is a very powerful light. You can vary the amount of light you want by using the switches to turn on just two of the four bulbs, or all four at once. The DuroLux T5 system is a very solid option.​ You can safely power up to 5 fixtures from a single outlet. The ballast is included in the fixture. The setup is pre-wired with a 15 ft power cord and chains for hanging. The power outlet on the fixture itself makes it simple to daisy chain multiple fixtures together. The DuroLux T5 powered grow light outs out an impressive 20,000 lumens while using only 216 Watts of power. With it’s 95% reflector and daisychain option, this T5 system is simple to use and very efficient. It will provide plenty of light to your plants. Included accessories: 4 6500K 4 ft lamps, hanging hooks and chains, 15 ft power cord. Outlet: On fixture. Power up to 5 fixtures off one wall outlet. Variable output: Two dimming switches for inner or outer bulbs. Lightingwise 4 FT 6500K T5 HO Fluorescent Grow Light Bulbs have been very well received by customers on Amazon. Reviewers say these red spectrum T5 bulbs work as described by the manufacturer. Because the bulbs are red spectrum, they are ideal to swap into your T5 system during the flowering stage of your marijuana plants. You can replace half of your fluorescent T5 tubes in your fixture with red spectrum light. Alternatively, you can add an additional T5 fixture with only red spectrum bulbs and leave your blue spectrum lights above the plants. Fixture Compatibility: For use with all T5 HO fixtures requiring F24T5HO 24 watt linear tubes. Flowering lamp: 3,000K bloom spectrum. Lifespan: Extended 20,000+ hour lifespan. Warranty: 1 year manufacturer’s warranty. The Century 24 Hour Plug-in Mechanical Timer Grounded to control your T5 grow lights automatically instead of switching them on and off manually. This will save your a lot of time and prevent mishaps when you can’t be there. AcuRite Indoor Temperature and Humidity Monitor to monitor conditions in your grow room. 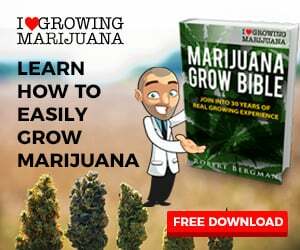 Learn more about the best grow lights for marijuana. 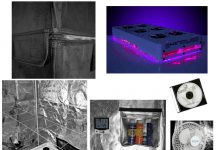 Previous articleBest marijuana grow lights for growing weed indoors! 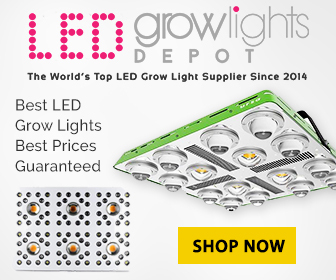 Next articleBest LED grow lights for weed in 2018!